Our new swingarm kit in aggressive Kreuzfeuer design fits all Breakouts FXBR and Fat Boys FLFB from 2018 onwards. If the suspension is limited, this kit also fits the brand new FXDR 2019. 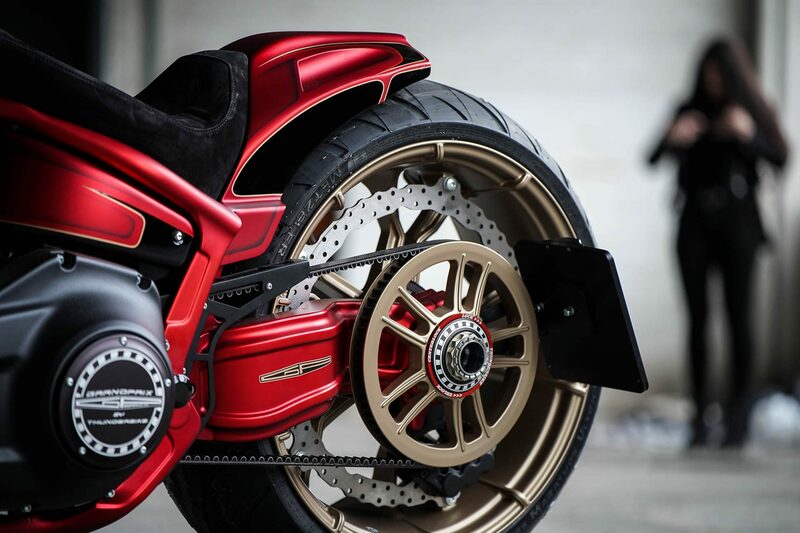 The lightweight aluminium swingarm offers more visibility on the rear wheel due to its slim design. In combination with our TB Pulley Brake System and a TB Design Wheel, this clean look is once again supported. In addition, the large recesses in the swing arms save a lot of weight. 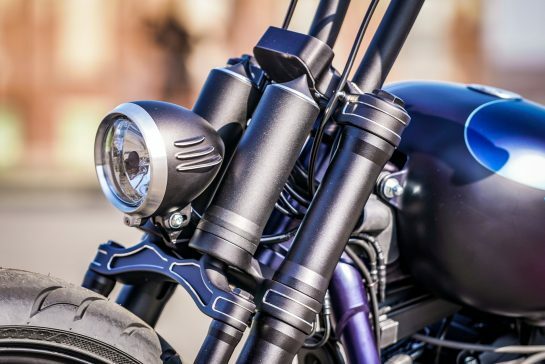 Compared to the Swingarm Kits for Twin Cam models, this new kit no longer requires an offset kit, which means that the swing arm conversion can be carried out more cheaply. The Swing Arm Kit is optionally designed for 18″ (66-74-040) or 21″ (66-74-050) wheels. In addition, the swing arm can be supplied rawness, powder coated or bicolor cut. Tyres up to 260mm wide can be fitted. 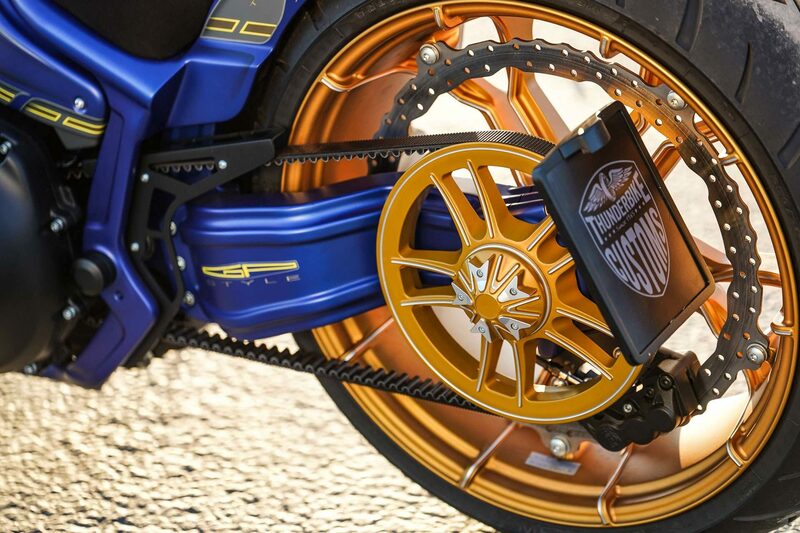 The swingarm is designed for the OEM brake system, but can also be combined with a TB Pulley Brake System. Of course this kit, like all our swingarms, is TÜV approved. 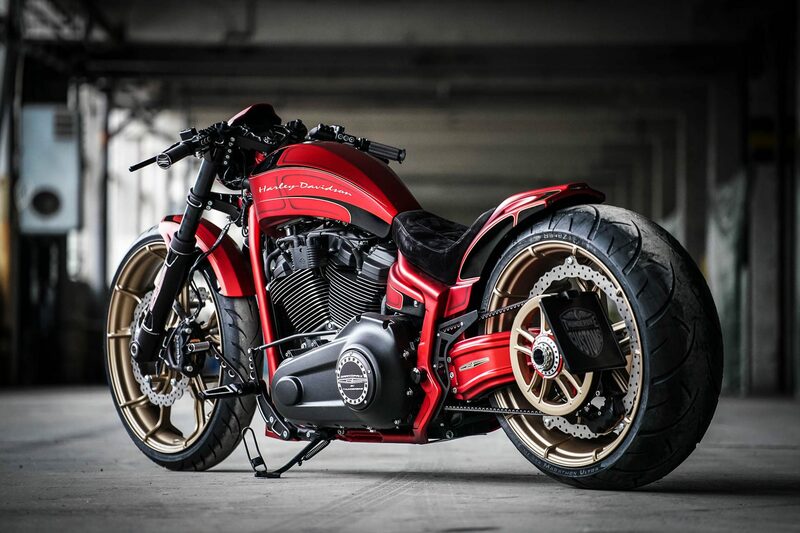 Milled custom swingarm for Harley-Davidson Breakout and Fat Boy models from 18mm with up to 260mm tires. The swingarm is delivered ready to install with all attachments. The finish can be freely selected in the accessories. 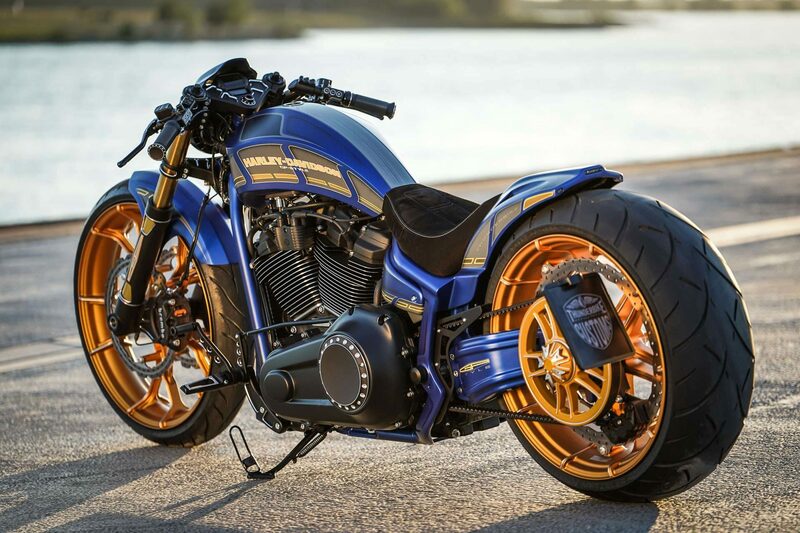 Milled custom swingarm for Harley-Davidson Breakout and Fat Boy models from 18mm with up to 260mm-21″ tires. The swingarm is delivered ready to install with all attachments. The finish can be freely selected in the accessories. A new drive belt is required for mounting. For the finish three different versions are available in the shop under the accessories category. The Crossfire swingarm can be matt or shiny powder coated or in a bicolor-cut finish. 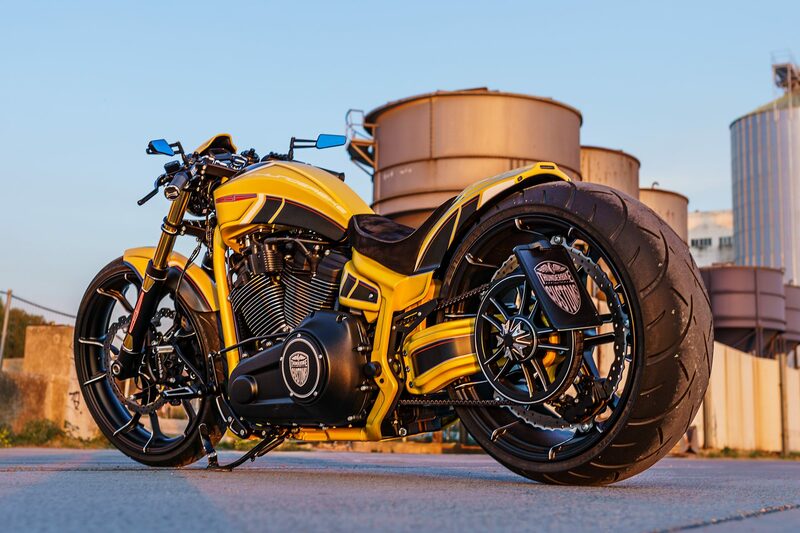 Our Single Side Swing Arm offers almost the same features as our Aluminum Swing Arm Kits and also fits Breakout, Fat Boy 2018 and FXDR 2019 models. 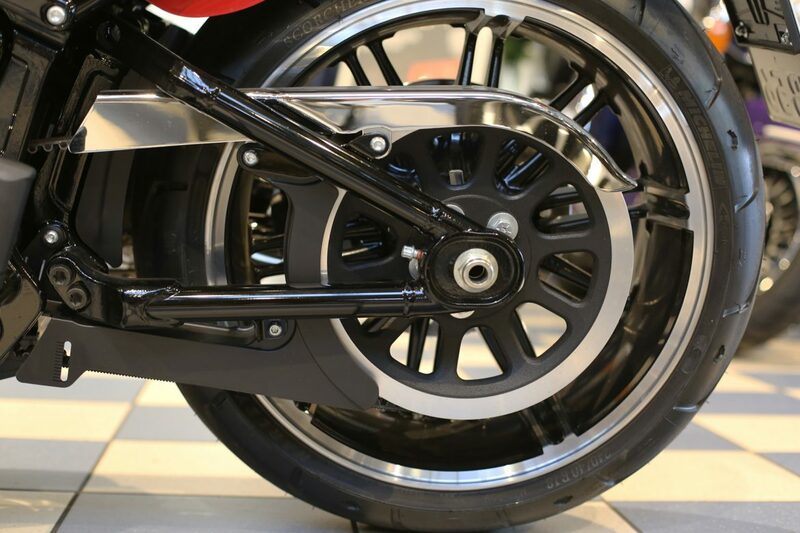 In addition, this swingarm offers a completely clear view of the rear wheel. This swingarm only fits 21″ wheels, either 3-piece TB wheels (66-74-021) or 1-piece TB wheels (66-74-031). Tyres up to 260mm wide can be fitted. During the development a brand new drive system with hollow rear axle was developed. The belt tension is adjusted via an eccentric. The swingarm kit contains a complete perimeter brake including brake caliper, as well as a valid TÜV certificate. Optionally the kit can be delivered rawness or powder coated. Our Single-Side Swing Arm is made of CNC milled aluminium and is delivered ready to install (with all attachments and license plate holder). Brake caliper and perimeter brake disc are also included. The swing arm is suitable for 9×21 inch wheels and 260mm tires. The finish initially includes the raw, pre-ground version – further finishes are freely selectable in the accessories. A new drive belt is required (please order separately). 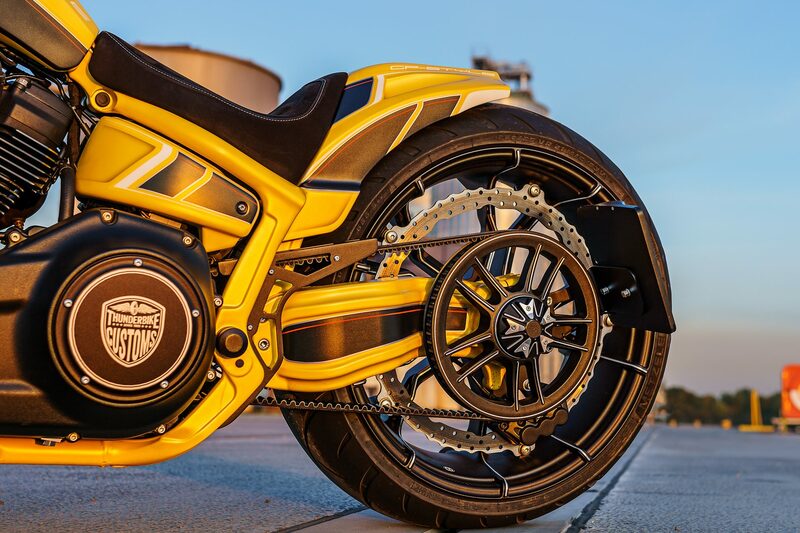 Our Single-Side Swing Arm for Breakout, Fat Boy and FXDR models from 18 up with Thunderbike monoblock wheels is made of CNC milled aluminium and is delivered ready to install (with all attachments and license plate holders). Brake caliper and perimeter disc are also included. The swing arm is suitable for 9×21 inch wheels and 260mm tires. The finish initially includes the raw, pre-ground version – further finishes are freely selectable in the accessories.